Aizawl, Nov 20 : Mizoram will vote on November 25 to elect a new Assembly and politicians are showing the way when it comes to campaigning. In this Northeastern state candidates from different political parties come together to face questions on joint platforms. Like students getting ready for an exam, candidates from three different political parties competing for the Aizawl North Constituency must answer four questions on an open platform before a select audience in order to win votes. "This is an excellent arrangement because you can express yourself to the people. If you call public meeting here in Mizoram only your party people come, rest do not come. Therefore it is a very good arrangement," says Congress MLA Lalsawta. 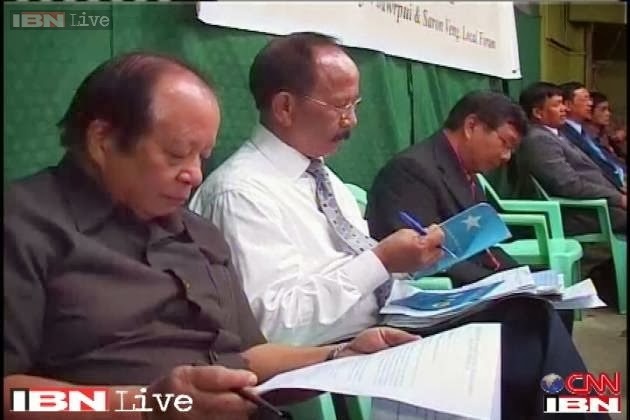 In Mizoram it is the church-sponsored Mizoram People's Forum, a self-appointed watchdog of elections that organises meetings. The entire session is recorded and will be broadcast on local television stations for free. "The main purpose is to have a peaceful election. Local forums are organising this so that candidates can explain their manifesto. The local forum is established by the Presbyterian Church. It is very effective and because of this it happens," says Rammuana of the Mizoram People's Forum. Forget the Election Commission, in Mizoram it is the church-sponsored Mizoram People's Forum, a self-appointed watchdog of elections that organises meetings in which they get candidates from all political parties and they remind them what is okay to do and what is not when it comes to elections in the state. Formed in 2006, they even have a 20 point MoU on dos and don'ts signed by political parties. But the question is, are they stepping into the Election Commission's shoes? "Not at all, not at all! We are supporting, we are supporting, we don't go against the Election Commission. We are strengthening their hands," says Mizoram People's Forum activist F Lallura. As 7,00,000 voters get ready to elect a new 40-member Assembly on November 25, when it comes to campaigns of the future, Mizoram is showing the rest of India the way.